The JBC NAST-1B (formerly known as the JBC NAST-1A) was one of JBC's most popular Rework Stations. With this in mind, JBC recently released the NANT-1B - which includes not just one, but two soldering irons. This latest edition from JBC is guaranteed to leave NANO fan's extremely pleased. The NANT NANO Soldering Station is designed for the highest precision soldering in mind. 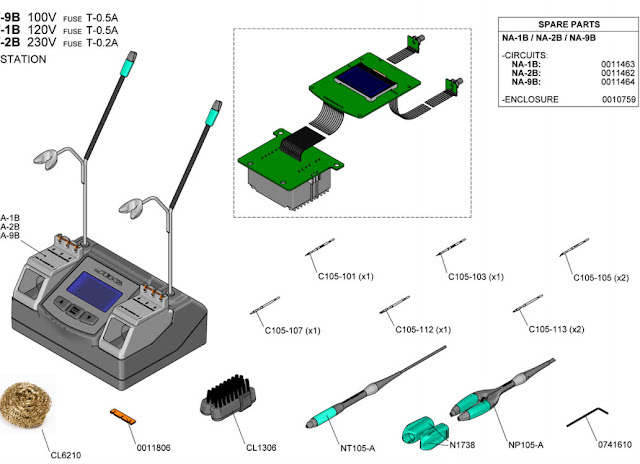 This station incorporates the same control unit as the JBC NAST-1B (120V) but comes with TWO NT105-A Nano Soldering Irons (instead of soldering tweezers -included in the JBC NAST model). These JBC handpieces are considered the best solution for very small-sized SMD components such as chips (0402, 0201, 01005) or those that require a microscope. These soldering irons are exceptionally light in weight which allows for comfort while in use. While they are light and small in size, they will provide up to 15 watts of power (while using C105 soldering tips). Like all JBC soldering stations, the JBC NANT/NANO control unit incorporates the exclusive JBC heating system and the intelligent sleep and hibernation functions. The digital menu allows the user to personalize over 20 specific parameters with ease. Includes the NAST control unit, two NT105-A NANO soldering irons, 6 soldering cartridge tips (JBC C105-101, C105-103, C105-105, C105-107, C105-112, C105-113), 0011806 cartridge extractors, JBC CL6230 metallic brush, and the JBC CL6210 brass wool. Additionally, this JBC rework station also comes in 230V and 100V versions. For the 230V version (JBC NANT-2B) visit us at janelonline.com. For, the 100V (JBC NANT-9B) version please contact us today. 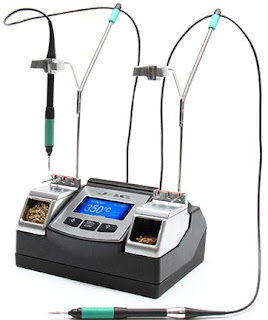 To shop the complete JBC Soldering Line (including these stations) click here.